ISRO along with Space Applications Centre published a Notification. And ISRO SAC Recruitment 2018-2019 Notification is now trending. And this advertisement is for 77 Technician ‘B’, Scientist/ Engineer, Scientific Assistant, Cook & Catering Attendant Vacancies. Therefore, all those contenders who want to get into such prestigious organization can check the availability of positions. And then proceed to apply for the ISRO SAC Openings 2018-2019 by submitting the application form in the prescribed format before the closing date. 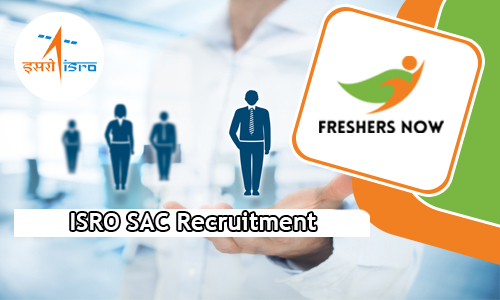 Now, the main reason for writing this article, to provide help for the contenders who are looking everywhere to know about ISRO SAC Recruitment 2018-2019. After checking this post, till the end, the people will get an idea about mandatory and important details such as Important date to apply which includes starting and closing date, Educational Qualification, Age limit, Name of the Vacant position, Number of positions, Application Fee, Salary, and hiring process. The Officials of ISRO & SAC mentioned all the important information in the advertisement. Therefore, one by one we are going to write down all the details in this post. Therefore, those contenders who are willing to apply first and foremost should know about the requirements. In which having the educational Qualification is a must. After knowing all these information an individual should submit the application form by the closing date. According to the data in the ISRO SAC Recruitment 2018-2019 Notification, the deadline is 2nd April 2018. The Final date is approaching fast. Therefore, all the people can check the details and proceed to apply. Remember that after last date your application is invalid. So, keep this in mind and check the details of this ISRO SAC Recruitment 2018-2019. More other details related to this ISRO SAC Vacancy 2018-2019 are incorporated further in next sections. Check them. Please check the above table. It contains all the information you are searching for. Our team has tried to fit all the data in that table. Therefore, all you have to do is check the information and proceed to apply. As per the data in the official ISRO SAC Recruitment 2018-2019 Notification, all the contenders who are applying should have finished their Ph.D. in topics related to fields of Electronics/VLSI/Microwave/ B.Sc. in Multimedia/Animation/Matric (10th) and ITI in relevant Trade as the educational Qualification. So, please apply for the available Vacancies only if you are having all the Qualifications correctly. Check the next sections of this post, for more other information. After checking the ISRO SAC Recruitment 2018-2019 Notification, we came to know that having correct age limit is also quite important. As per the data in the advertisement, all the contenders should have the minimum age of 18 years. While the Maximum age of the applicants can be between 24 years to 40 years. The Maximum age will change for each and every Vacancy. Therefore, before applying for a position, all the contenders should check the advertisement for the Maximum Age limit. Also, as there is the availability of Age Relaxation. So, get the details about Age relaxation, we suggest the people, to check the advertisement. For the sake of the applicants at the end of this post, we are linking the Notification. Just by clicking on it you can download the advertisement. More details are available further. In the official ISRO SAC Recruitment 2018-2019 Notification, there is no mention of the application fee. Therefore, there is no need to make any kind of payment related to the Application Fee or Registration Fee. But it would be nice and appropriate if contenders check the ISRO SAC Recruitment 2018-2019 Notification twice before proceeding to submit the application form. As the officials of the ISRO and SAC will not even consider the application from the people if they are not possessing all the qualifications as of on time of applying. Drop the thought of applying here only, if you are not having all the requirements. This will help you from the disappointment. For more such updates and Fast notifications along with the complete information, you can always check our site Freshersnow.com. Now, after cross-checking and submission of the application form. The Officials of the ISRO and SAC will go through the received applications. Find out other information. As per the information in the advertisement, all the people should face the Recruitment Rounds, to get the job in the ISRO SAC. So, as per the data, the officials are going to choose the best performers by considering the merit shown in these rounds. According to the data in the advertisement, the applicants will have to clear the Written Examination follows by the personal interview. Apart from these, there are no other rounds. So, prepare well and perform well to get the job in the organization. But Cracking the ISRO SAC Exam is not an easy task. There is so much competition. Therefore, even the officials are tightening the Tests. So, keep this in mind and prepare. And coming to another information in the ISRO SAC Recruitment 2018-2019 Notification, contenders will also get the Monthly salary. Officials of the ISRO and SAC mentions that the selected contenders will get the Pay scale between Rs.1,900 to Rs. 2,08,700/- Per Month. All the candidates should notice that this Salary will differ for each and every position. Therefore, please check the next sections of this article. Or check the ISRO SAC Recruitment 2018-2019 Notification twice for the Post-Wise Salary information. Along with all these, we even gave some simple steps at the bottom. So, these steps will help the contenders, to apply for the ISRO SAC Recruitment 2018-2019 before the final date. So, we all hope that you are happy with the details provided related to ISRO SAC Recruitment 2018-2019 Notification. Therefore, for more information try to come back.